The Labasa women’s football side lifted the 2018 Vodafone Women’s Inter District Championship title in style recording a 2-0 upset win over a star-studded Ba in an exciting final at Ratu Cakobau Park in Nausori on Sunday. As expected, the match started on a high with early pressure on both goals. Ba fielded a total of ten current national team reps and they created numerous opportunities using their tactics and experiences, however failed to capitalize. Labasa, who had the services of three current national reps, was mostly utilizing on the counter attacks. 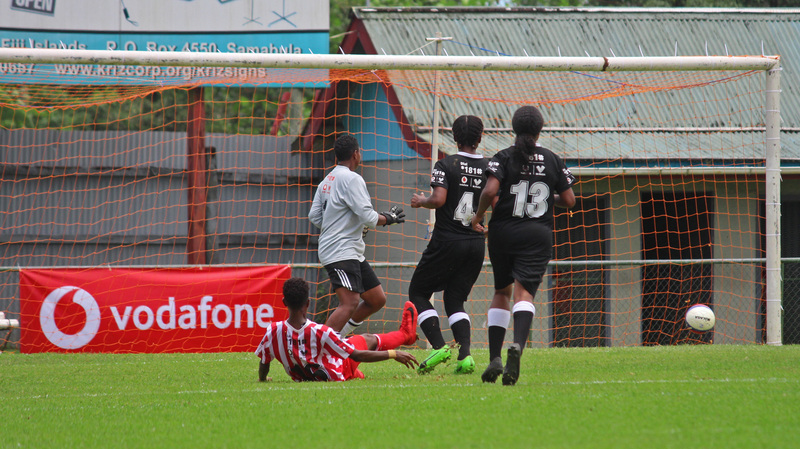 In the 31st minute, Sofi Diyalowai beautifully outclassed the defenders following a through pass from Jotivini Tabua and placed it past diving goalkeeper Ateca Tuwai as Labasa led 1-0 at the breather. Stella Naivalulevu doubled the lead in the 52nd minute as she walked inside the Ba 18-yard box and beautifully chipped it over goalkeeper Tuwai to seal a 2-0 win. Two minutes later, Ba received a setback when Sonali Rao was shown a direct red card for throwing a punch on Labasa’s Shayal Sindhika. Ba was reduced to nine players when Cema Nasau was shown her marching orders after a second yellow card followed by Labasa goalkeeper Sulia Qalolo receiving a direct red card for retaliation. Winning coach Arthur Simmons commended the girls for a job well done. “We worked to our plan and achieved our goal. The girls stuck to our plan which was quite surprising because most of the time we put plans and they do not follow it,” Simmons said. “But since they have been following the plan, the result speaks itself. “Two wonderful goals, couldn’t for anything better. We missed a lot but that’s soccer. Simmons now sets his eyes on the CVC title. “Now we look forward to the next CVC. Labasa walked away $4,000 richer while Ba settled with $1,500 as runner up.